The coastal weather makes Cannes a great place to go for a walk. Cannes has an international reputation for glamour. The streets are lined with vibrant tropical flowers and the beachy coastline is dotted with luxury yachts. The Mediterranean climate of the Cote d’Azur makes Cannes a perfect place to lie on the beach and relax but why not try something different? The coastal weather also makes Cannes a great place to go for a walk. 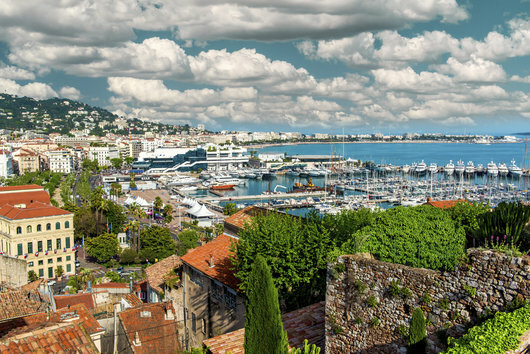 Meander under lush palm trees and explore some of the most beautiful streets in Cannes. AESU has outlined some of the places to check out on foot. Take a stroll and see where the day takes you! Hundreds of years ago, this street was the original road into Cannes. Now it’s known for its climbing cobblestones and its stunning views of the Mediterranean and La Croisette. Le Suquet is the ‘old town’ of Cannes and it is frequented the historical buildings you can find in this area. It was once home to the fisherman who lived in Cannes but now it hosts delicious restaurants. The Tour du Mont Chevalier is also here. Climb up this 11th century tower to get some great views of Cannes. This street is in the Le Suquet District and is where you can find the high end boutique shopping Cannes is renowned for. The 18th century houses that line this street have been repurposed into small shops and restaurants. It’s the perfect place to search for a non-touristy souvenir from Cannes or sample a tasty macaroon. This street is where you’ll find all the fancy stores (and maybe some famous people!). The Rue d’Antibes is home to luxury stores and some more affordable options like Zara or Mango. This is the Cannes equivalent of the Hollywood walk of fame. Include this on Cannes walk so you can take some pictures with your favorite stars of the past. You can find the Path of the Stars right outside of the Palais des Festivals. La Croisette is maybe Cannes’s most famous place to take a stroll. Walking along the Promenade de la Croisette will afford you stunning views of the Mediterranean. Casually meander along la Croisette and choose which beach club you’d like to go to later in the day or take a look at what the street vendors are selling that day. Viewing the sunset here is a fun option too but it can get crowded. Try getting up early and taking a walk for sunrise instead. You won’t be disappointed by the view! Have You Always Wanted to Visit France? Why Wait? AESU offers unique, exciting travel programs for college students and young professionals at affordable rates, including several trips to France – Cosmopolitan, Explorer, Euro Focus, Great Escape, and Euro Spree. Each trip is action-packed and informal – designed for people your own age. We are also able to design custom tours just for your group. Early Bird Special: Save up to $400 when you book and pay in full by September 25. If you have any questions or want help booking a fun-filled and, perhaps most importantly, affordable trip to Cannes, France, please contact AESU by calling 800-638-7640 or fill out the contact form found on our website. This entry was posted on Thursday, September 24th, 2015	at 2:55 pm	. You can follow any responses to this entry through the RSS 2.0	feed. Both comments and pings are currently closed.